You might not consider a pastry recipe to be quick, but this one really is. It makes four parcels, so either serve it when friends are coming round, or freeze two to enjoy another time. Preheat the oven to 220°C, gas mark 7. Cut the pastry into 4 rectangles and, on a floured surface, roll each one out into a rough 18cm square. Divide the peppers, artichokes and olives between the 4 pastry squares. Push the edges of the pastry up around the vegetables to make a rough circle. 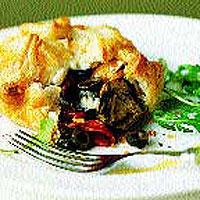 Top each parcel with 2 slices of goat's cheese and place on an oiled baking sheet. Brush the edges with beaten egg and bake for 20 minutes or until golden brown and well risen. Serve with wild rocket.